The software reviewer grumbles as he opens the package and surveys its contents. He thinks to himself, Great! Just what I needed. Another flight simulator. Can't wait to try this one. He'd rather visit the dentist. Not that the reviewer has anything against fake flying. At one time in fact, he'd relished the opportunity to solo for a few hours in front of his computer monitor. Neat. Touch-and-goes by the dozen without ever having to pop a Dramamine. But that was a while ago. The guy still enjoys flying his keyboard, but can't find much time for computerized flights of fancy. Too many new products to evaluate. Too many reviews to write. Most are not too time-consuming. Sure, a thorough review requires hours of running the program to get a good feel for it. But that's the fun part of the job. The hard part is absorbing the documentation from some of the programs being evaluated. It can be a real grind when the program being reviewed comes with so many pages of documentation it would have made Gutenberg consider another line of work. Guess which type of software usually comes with the most documentation (not counting virtually any MS-DOS program, many of which appear to have been created primarily to keep this country's paper mills in operation). Need a clue? Let's just say that if these programs had been around in Orville and Wilbur Wright's days, we'd still be riding railroads to go cross country. Hopefully, you're now beginning to understand my aversion to flight simulators. Most of those I've tried are great, but they're accompanied by reams of documentation that make them a chore to learn. Fact is, I got through four years of college without having to read as much. So picture my reaction when SkyChase, a program from Maxis Software, shows up in the mail. True, I'd accepted the assignment from ST-LOG Editor, Clayton Walnum, but surely you can understand my having second thoughts as visions of 1,000-page instruction manuals danced in my head. But wait a minute! What's this? The package only weighs a few ounces. What did they do, forget to pack it? Let's see. Hmmmm...only one disk. And a "Flight Manual" that's only 19 pages long. Impossible! No, not impossible—ingenious. Credit SkyChase designer and programmer Ralph Russell with performing an impressive feat. He has succeeded in taking the essence of modern air-to-air combat and distilling it into a exciting, enjoyable and satisfyingly realistic jet-fighter simulator. Did I forget to mention that it's also amazingly easy to learn? The main reason for that is Sky-Chase's design. This isn't the kind of flight simulator in which the person at the computer works up a sweat punching keys, trying to perform every simulated action from starting the ignition to removing the wheel chocks. Russell decided instead to concentrate on simulating the action that takes place after two combat fighters begin tangling in the ozone. The game begins with the jets already airborne. Maneuvering them is a breeze. Using a joystick (a mouse cannot be used), the pilot makes the plane climb, dive or bank (turn) by simply pushing the joystick in the corresponding direction. The only other flight element controlled by the player is thrust, which determines the aircraft's speed and is increased or decreased using the keyboard. Maintaining control of the jet has also been simplified by keeping the number of on-screen instruments to a minimum. 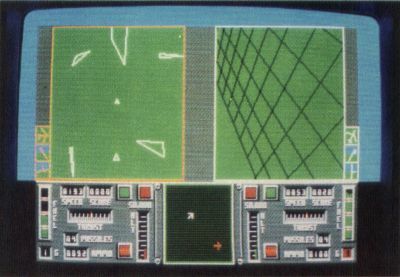 There is a radar-type screen that shows the jet's position and direction, and a perimeter indicator that warns when a jet is approaching the boundary of the predetermined combat area. Other indicators show altitude, degree of thrust, speed, G-forces being exerted on the pilot, fuel and ammunition remaining and the status of the automatic missile-targeting system. Finally, there are three little graphic displays that depict the jet's attitude in terms of pitch, heading and banking. I'll grant you that on paper that may sound like a lot of instrumentation. But compared to other flight simulator's, SkyChase's cockpit display is downright sparse. And that suits this jet jockey just fine, since it enabled me to concentrate on important stuff like trying to obliterate my airborne enemy before he scattered my molecules in the wind. But the best benefit of the scantily clad cockpit is that it allows the ST's sharp color monitor screen to show two such cockpits at the same time. Each one represents the view from a different jet. That makes for some intriguing dogfights, since you have a chance to sneak a peek at your opponent's instruments to see what he's up to. You can even torment yourself by watching as his air-to-air missile sight locks onto your soon-to-be-defunct fuselage. The split-screen mode can be turned off if you're battling against the computer. That's just one of many play options offered by SkyChase. While space doesn't permit listing all the options, let's say there are enough of them to extensively alter play parameters and permit some intriguing combat scenarios. Also appreciated is the design of the option menu and submenus, which are impressively easy to use. While all of these features are wonderful, they would have been wasted on a program with mediocre animation. After all, how much fun can you have with a jet-fighter simulation in which the aircraft seem to move no faster than one pixel per minute? Thankfully, that's not the case with SkyChase, which features animation as smooth and fast as any ST program I've seen. Response to joystick input was also superb. 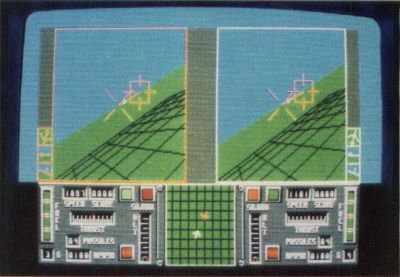 And although I'm not a big fan of the wire-frame graphics used in SkyChase, the effect of flight was so realistic and the simulated combat so stimulating that it was easy to forget the enemy was nothing more than a hollow line drawing. In other words, Maxis' SkyChase scored a direct hit with this reviewer. If you like your flight simulators spiced with wing flaps and ailerons and all sorts of other aeronautical gadgets, it's probably not for you. But if you'd rather shoot down bogeys than read compass headings, you'll love it. If you'd rather shoot down bogeys than read compass headings, SkyChase is the flight simulator for you. Scott Wasser has been a daily newspaper reporter and editor for the past 12 years and has been interfacing with computers for the last four. 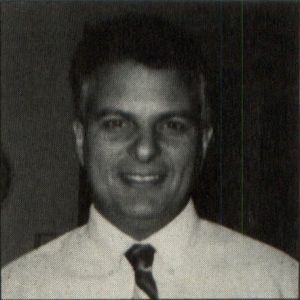 He has written columns and feature stories about computer hardware, software and home electronics, and is a regular reviewer for ST-LOG.